Tired, perhaps, of juggling mainstream cellular carriers, RadioShack may be launching its own wireless branding. According to a tip we've received, the Shack is gearing up to launch RadioShack Mobile, a no-contract MVNO based on Cricket Wireless. 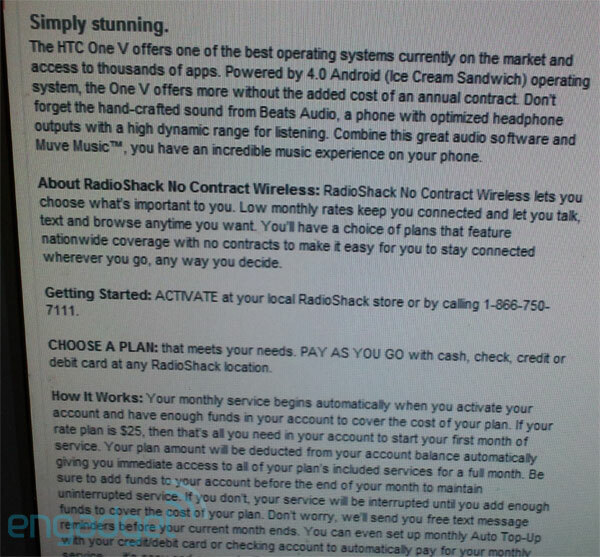 A pair of leaked screenshots (above and after the break) seem to show a RadioShack Mobile-ready HTC One V listing and a snippet of an accompanying product page that promises low monthly rates without the shackles of a 2-year agreement. The Cricket connection? That can be found under the page's "getting started" section, which lists an activation number that pipes into Cricket's customer service line. Details on pricing and plans are scarce, but we're being told that RadioShack Mobile is expected to mirror Cricket's existing offerings, and may also offer the Huawei Mercury, the Huawei Pillar and a 4.3-inch Android device from Alcatel. We contacted RadioShack for a statement and were told that it couldn't comment on rumors or speculation.